The Deutsch-Drahthaar was created in Germany in the late 19th century by a small group of dedicated breeders who set out to develop a versatile hunting dog that would satisfy all aspects of German hunting in field, forest, and water. This group of breeders succeeded in creating a versatile hunting dog that took its traits from the best dogs of the existing coarse hair breeds, cross bred with the shorthair blood. These ancestors included the Stichelhaar, Pudelpointer, Griffon, and the Deutsch-Kurzhaar. The Deutsch-Drahthaar is a mid-sized, substantial dog. The height at shoulder varies from around 61 to 68 cm for males, and 57 to 64 cm for females. The coat is generally wiry, and tightly fit with a thick under wool. This coat was developed to provide optimal protection form external influences such as moisture, cold and heat, as well as thorns, brush and insects. The extended “eyebrows” and the typical beard give the DD his characteristic appearance. The breed has a variety of colorations. They are: brown and white or black and white ticked usually with some solid patches, and solid brown with or without a white chest patch. 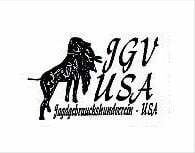 A group of breeders founded the Verein Deutsch-Drahthaar (VDD) in May 1902. The driving force behind the Deutsch-Drahthaar, Freiherr Sigismund of Zedlitz and Neukirch, demanded that the primary breeding goal of the hunting dog be versatile performance ability. His thoughts became the principle of the VDD breeding program: “through performance to standard”. This principle is still upheld today, with registered breeders following a tradition of required performance and physical evaluation for all of the dogs used in the breeding program. Many breeders of the German Wirehaired Pointer (GWP) errantly refer to their breed as Drahthaar. In addition to significant differences in breed standard, the Wirehair has been bred without regulation or restriction since the late 1950’s, but especially without the performance testing that proves the ability of the Drahthaar. After years of unrestricted breeding and no versatile performance standards the German Wirehaired Pointer has evolved into a distinctly separate breed. Click here for a little more history on the German Wirehaired Pointer (GWP). Today’s DD is the dog most frequently used by the German hunting establishment, and is rapidly gaining popularity elsewhere, and that is not without reason. The Deutsch-Drahthaar is a passionate, hard-working dog. They are noted for their endurance and willingness to obey, as well as the ability to concentrate on the work at hand. After persistently searching the field with a sensitive nose, the DD shows the game by pointing, so that the hunter comes to a calm shot. Shot birds are hunted down and retrieved to the master. In particular, DD’s exhibit the characteristic of a retriever of lost game. They do this by their inbred capacity to track and pursue (and even dispatch) wounded game persistently and uncompromisingly in some of the most difficult conditions. This saves the game from unnecessary suffering. Their endurance, swimming ability and heavy coat also make them well suited to waterfowl hunting in the most adverse conditions. While the Deutsch-Drahthaar is a superb hunting companion, they are also well suited as a family dog. DD’s are normally gentle and friendly with children and other dogs, and are known to become protective of their “family” and home. Their intelligence and calm manner help them in adjusting to various living conditions. 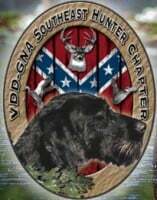 VDD Breeding Regulations specify that DD’s who show unwarranted aggressiveness toward people or other dogs are to be removed from the breeding program, so these traits do not get passed on. As with all genuine hunting/working dogs, the DD needs legitimate specialty training and consistent guidance. Only when given sufficient training and activity does he seem content.